The Alyssa Milano created mini-series, Hactivist, launches from Archaia and Boom with an intriguing mixture in the opening issue. The comic contains a number of direction shifts as the story kicks off a number of aspects to the overall plot thread. The hope is that everything will dovetail together as the series moves towards a conclusion. As far as opening and individual issues go the comic has the promise of greatness but reads a little disjointed because of the shifts. There's a lot to like in here if you like conspiracies and technology driven ideas backed by strong character work. I recommend checking this issue out. The opening pages take place in Tunisia as a small group of rebels are on the run from the military. They seem to be risking life and limb to get their message out but the numbers they are reaching are very small for the task at hand. At their base they are given a gift of an open communication link to thousands of potential followers. The pot gets stirred, probably in their favor. From here we get an introduction into a couple of billionaires, Nate and Hiccox. They are young, seemingly intelligent and are hackers that happen to own and operate the biggest social media company, called "yourlife." The book then dives into what "yourlife" is all about and this is probably the best part of the comic book. Their company's ambition is creative and very intriguing. The company has good intentions on the surface but the company's power allows it to create havoc and it also allows them the possibility to introduce a tremendous amount of unwanted trouble. The artwork is very good. The book has a lot of noir elements to it and the book's art follows in that style. It's a style that uses shadows and subtle looks from characters to drive home a given point during a sequence. You never quite know which is a protagonist or an antagonist and there's something of an art to pulling that off. The bold coloring helps to keep the book looking lively despite the limited amount of action. Overall the art looks good and is definitely a good fit for this book. 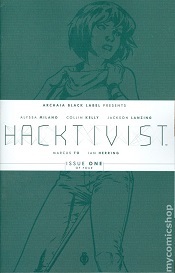 Hacktivist has the potential to be great. The first issue rolls out a couple of interesting characters. They could end up being cookie-cutter characters, but they could also be something special. The opening issue feels a little disjointed but at least we get a good idea of what the plot elements will be for this mini-series. The pieces are in place and hopefully this mini-series will pull it all together before it's done.